Do you know how many visitors you had last day, last week or last months? How many unique visitors were of them? How many times pages were viewed? What was the average to page view? 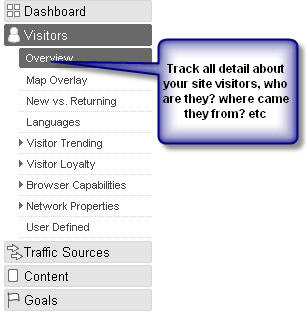 And there are so many elements that are need to track about your visitors e.g. time on site, bounce rate, new visitors, visitor’s language, network location, browser, operating systems, screen colors, screen resolutions, java support, flash etc. Comparison between new visits and returning visits – Tracking of all new visits and average of new and returning visits. You can analyze the performance and status of visits on your site comparing to new visits and returning visits. Language – Language was used by user to view site pages. All users are not aware from English language, therefore many users want to visit any site in their language, and they use their language. Visits – Total no. visitors come to your site via all the sources. Absolute Unique Visitors – No. of unique visitor among total no. visitors. Pageviews – Total No. views, pages viewed by visitors. Avg. Pageviews – Average of total page views by visitors. Time on site – Average of time spent by a single visitor on site during a session. Bounce Rate – How many visitors return from home page without any page impression of page views? New Visits – Average of total new visitors on your site. Loyalty – This term reports the no. of visitors visit your site a no. to times. Recency – This term reports the no. of returning visitors visited earlier on your site e.g. 10 visits 7 days ago or 3 visits 61-120 days ago. Length of visits – This term report the average spend time on site by a no. of visitors e.g. 500 visits spent time on time approx 0-10 seconds and 30 visits spent 601-1,800 seconds. Depth of Visits – This term report the no. of page viewed by a no. of visitors of website e.g. 536 visitors visit only one page or home page, 30 visitors visits 4 pages of site. Browser profile - Browsers used by users to view your site, like Internet Explorer, Firefox, Safari, Opera, Mozilla are great browsers and mostly used by web users. GA analytics generate a simple report what the browsers mostly using by user. This analysis can help you to maintain your website look according to browser compatible. Operating Systems – GA tracks the user’s operating system they are using like Windows, Macintosh, Linux, SymbianOS etc. Mostly users use Windows operating systems like XP, Vista, 2000, 98, Server 2003, 95, ME etc. You can also track the combination of Browsers and Operating Systems are using e.g. Internet Explorer / Windows, Firefox / Windows, Safari / Macintosh, Opera / Windows, Firefox / Linux, Firefox / Macintosh etc. Screen Colors and Resolutions – It help to designers to maintain their site colors and resolutions suitable for users browsers, screen resolutions, and screen colors. Generally screen colors in trend are 32-bit, 16-bit, 24-bit, and 8-bit. You can easily track what maximum user’s uses screen resolutions and colors to view your site. Generally and mostly users now uses the screen resolution of 1024x768, 1280x800, 1280x1024, 800x600, 1440x900 size. Flash Version – If your site have some flash animation then how much is it compatible with user’s flash version, can be track. Currently flash version are available of 9.0, 9.0 r47, 8.0, 9.0 and currently in trend very much. Java Support –Your website have some java scripts and java pop-up. Are they enabled in user’s browser or on their systems? ‘Yes or No’ you can easy know. If answer is no then you can take a decision or make a new plat to present your site using other Web2.0 methods. Network Location – a network location is a group of internet services providing in a particular area and region for general users, communities, companies like America online, AOL Inc are the network location. By Network location analysis, you can target your visitors and users easily. Connections Speed – Tell about the connection type and their speed like DSL, Cable, T1, Dialup, OC3, ISDN etc. nice blog!! keep it up. google analytics is best free solutions for small and mid size businesses.